Day 1 - I've been drinking bourbon and enjoying the stuff for number of years now. In fact, I've been enjoying it so much so, that it has more or less turned into a hobby. About two years ago I started this blog, and I took what was just a regular enjoyment of whiskey and turned it into . 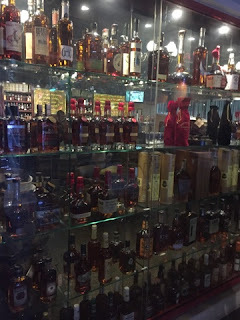 Yet, despite it being only a 5 1/2 hour drive away, I have never been to the Kentucky Bourbon Trail--I have never been to my bourbon Mecca. Well, as of yesterday morning, all that has changed. In celebration of my making partner at my firm, my neighbor, who is celebrating his 40th birthday, and I, along with our wives, embarked on a roadtrip to Louisville, where we have plans to visit six distilleries in two days. I'm so excited for this trip that I went to bed early last night and woke up early this morning without the need for an alarm or one of my three kids waking me up with screaming, yelling, thumping, etc. 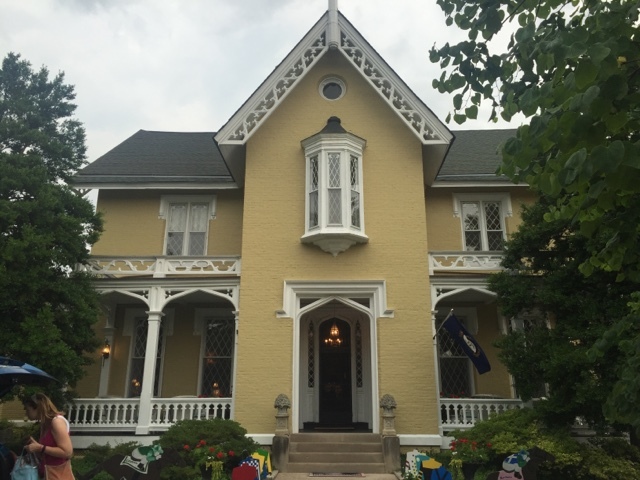 After a mostly uneventful drive down (though we found a great sandwich shop in Lebanon, IN called the Fig Tree--I highly recommend it), we pulled into the incredibly beautiful Inn at Woodhaven. This bed and breakfast will serve as our home for the next three days as we explore the Bourbon Trail and see all that Louisville has to offer. Plus, they keep free booze for all their guests in the common sitting room. Despite the stormy weather when we arrived, we headed straight downtown for some food and drinks. We started off at Hillbilly Tea where I enjoyed some barbecue frog legs and a pour of Elmer T. Lee. From there it was on to Down One, the first stop on my trip where I was absolutely impressed and amazed by their bourbon selection. I didn't go too crazy and simply enjoyed a pour of Calumet Farms (quite tasty!) along with my pulled pork, pork belly and bacon sliders (Three Little Piggies). I initially ordered a Rock Hill Farms, something I just can't find by us, but unfortunately they were out of stock. From there we had intentions of making our way to Haymarket, but that is when the skies decided to open up and we were forced to run underneath an awning of a building to escape the torrential downpour . . . only to have that building be struck by lightning! So, soaked and a bit shaken up, we decided to drive till we found somewhere with close parking where we could get drinks and some more food. 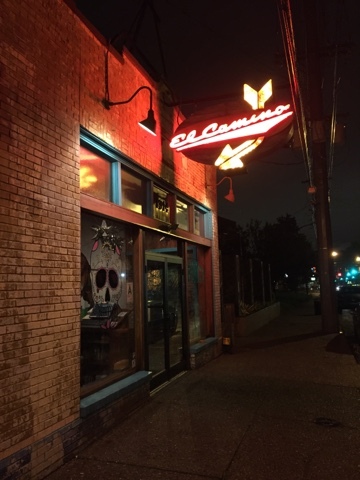 We ended up at El Camino, a taco joint that was open until 2:00 a.m. Although their bourbon selection is not very big (their tequila and rum selections are quite impressive, though), what they did have were all private select single barrels, so I enjoyed one of their Eagle Rare offerings to go with my tacos, which were really good! All in all, despite the driving and the storms, it was a fun day, and a good appetizer for the next day's events. We booked our tours through Mint Julep Tours, and our tour stops on the first day include Buffalo Trace, Wild Turkey and Four Roses. On day two we will be visiting Maker's Mark, Barton 1792, and Heaven Hill. It's quite the full boat, and yet each evening I expect that we will continue to partake in the local restaurants, bars, more great food and, obviously, more great bourbon. I cannot wait for the meat of this trip to begin! I feel like a kid getting ready to go to Disney World!